Aloo bonda is a very tasty, crispy & spicy chat. This is one of the popular Indian snacks served in parties, functions,etc, which can satisy most palates. Also this makes a perfect holiday snack menu for kids. It is very simple to make and delicious to eat during evening coffee or tea time. 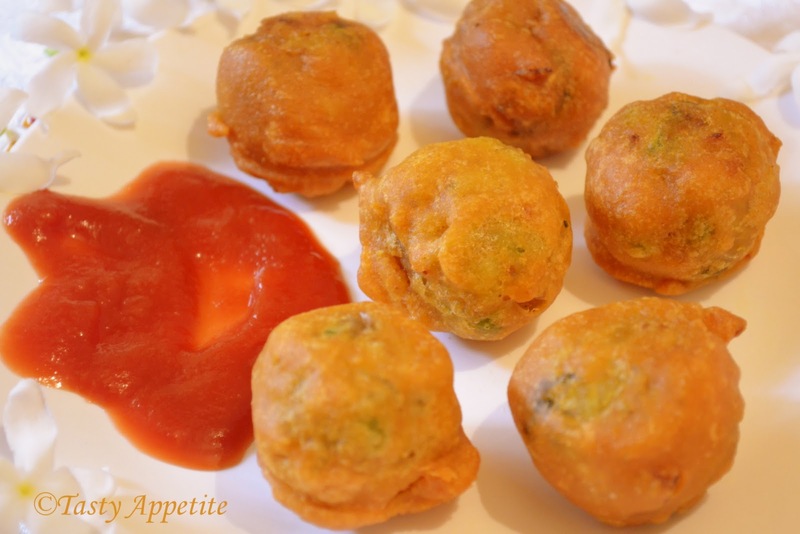 This delicious snack recipe is made of mashed potatoes, chopped onion, green chilly and dipped in spicy batter & then deep fried till crisp. Here goes the recipe of tasty & simple snack loved by all. Mix besan flour, rice flour, turmeric pwd, red chilly pwd, hing,cooking soda and salt. Add little water and make a smooth paste of it. The batter should not be too thick or watery, it should be in medium thickness (dosa batter) consistency, so that it can be coated over potato balls. Now the batter ( bonda mix ) is ready for the outer layer. Wash and boil the potatoes and smash it. Cook the peas and keep it ready. 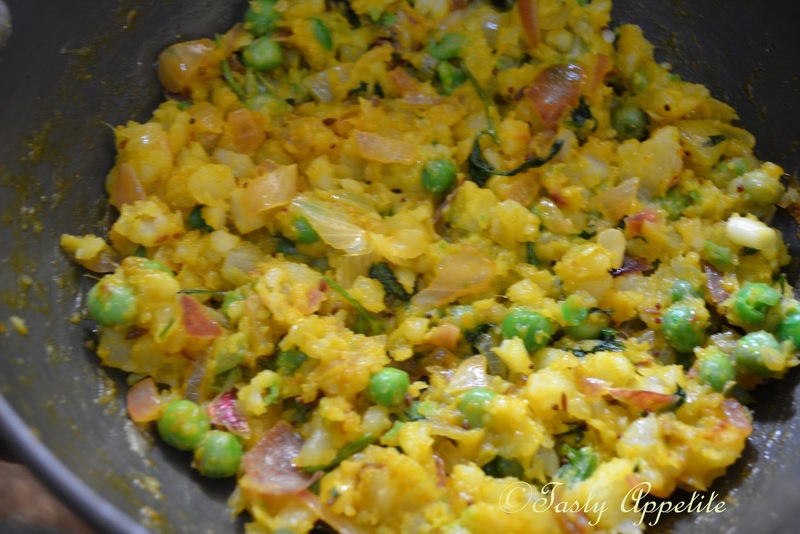 Add mustard, cumin, split urad dal and hing. Once it splutters, add the chopped onion and fry till golden. Add green chillies, coriander leaves, ginger and saute further. 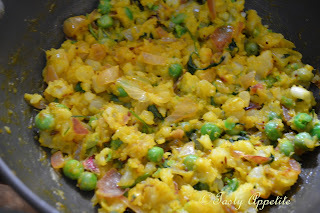 Now add turmeric pwd, smashed potatoes, peas and salt. Combine well and cook for 3 to 4 mins. Make small lemon sized balls out of it. 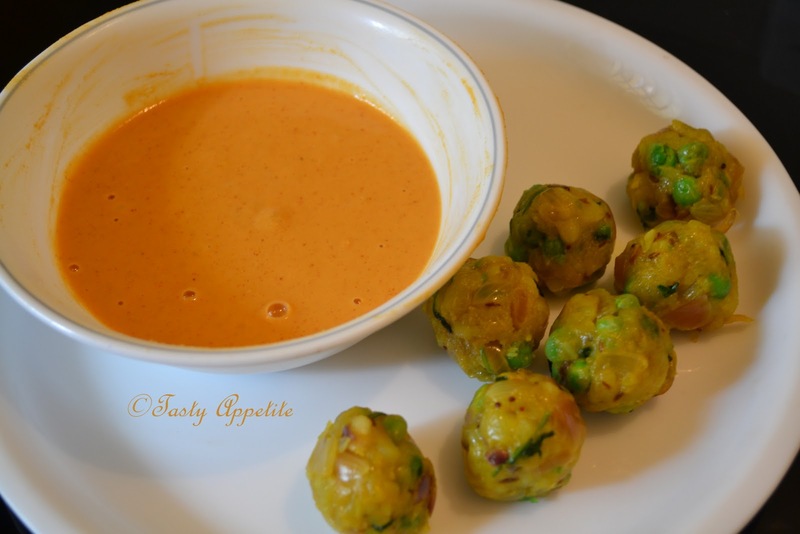 Dip the balls in the prepared bonda mix. Drop them in hot oil. Turn it to other side, deep fry till golden brown. Drain it from oil and place it in kitchen tissue. Repeat the same for remaining balls. Tempting Aloo Bonda ready to taste. Enjoy them hot with tomato ketchup or coconut chutney. Looks so crunchy and delicious....perfect snack for the winter! Delicious and perfect for evening snack with a cup of tea. 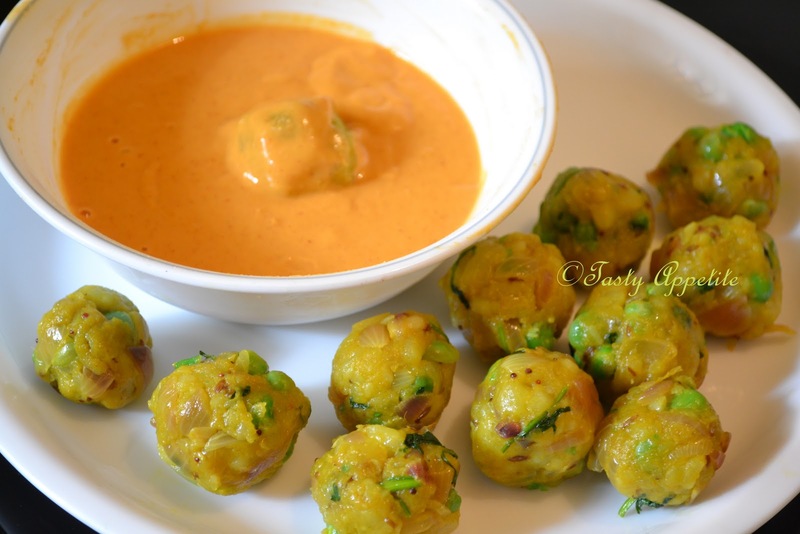 Yummy looking Aloo bondas. 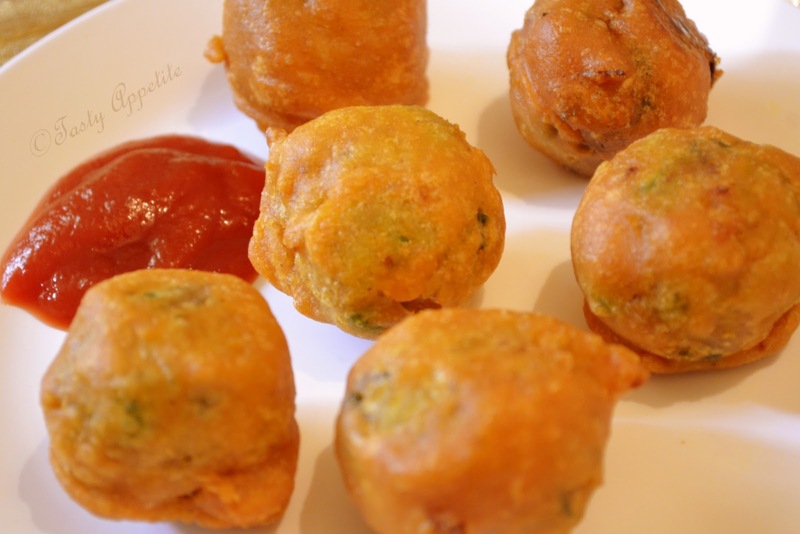 Thanks a lot for sharing this snack's recipe which is my favourite since childhood days. Love aloo bondas... this brings back loads of memories from school days! Your recipe n pictures look delicious! 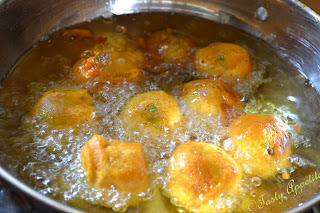 aloo bondas look so tempting..loved it.. Didn't know there are so many Indian snacks. This snack certainly looks good, too bad is I am avoiding all deep fried food. perfect evening snack.............luks so delicious n yummy. Mmmm...That looks wonderful Jay! Perfect with a cup of tea...One of my favorites. Oh, they look so yum Jay. Irresistible. nice snack for tea time !!! Somehow, I have never got the batter consistency right. But that was years ago, and ever since never attempted it again. I think I am motivated to give it another try. 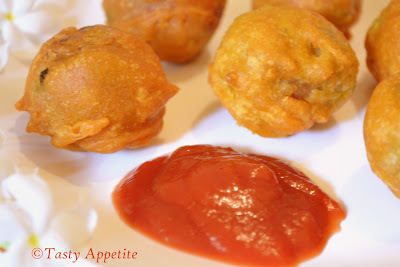 happy holidays n have fun..
Yum,yum,super crispy and tempting aloo bonda..
A tempting snack for anytime of the day!!!! Oh my, I love this Bonda :) my fav snack, perfectly done..
Nice and crispy batata vada..my all time favourite snack..
Yum! These look delicious! If I can find all the ingredients I'm definitely going to try this. So glad I clicked over here, you have lots of yummy recipes! Yum Jay, these sound wonderful and very unique! Very tasty n delicious yummy cake !! Little balls of heaven, looks amazing! These are so delicious and craving them now after reading the recipe! hi jay, we have here in philippines, but the stuffing is so unique. i never encountered like this before. the chutney looks lovely. I learnt to make this ponda just before I started my blog. they are truly delicious. Bonda looks so very delicious hasn't made this in a while got to try this soon. so tempting and delicious bondas.. Delicious and yummmmmmmmy bonda.. am drooling over it! Too good... jay! Jay, wish you a very happy new year in advance! These aloo bondas are just right for my family! Yum!! Been really busy but just wanna drop by to wish u Merry Xmas & Happy 2012! Perfect for the cold weather with some hot tea. Looks fantastic. one of my fav. winter snack ! Looks so attractive, nice & hot, crisp & crunchy and so delicious. What could be better than aloo bonda during winters looks great....and Happy New Year!! Este aperitivo tiene que estar muy rico. Apetecible en todo momento y lugar. Una delicia. Wow... that sounded very tasty. 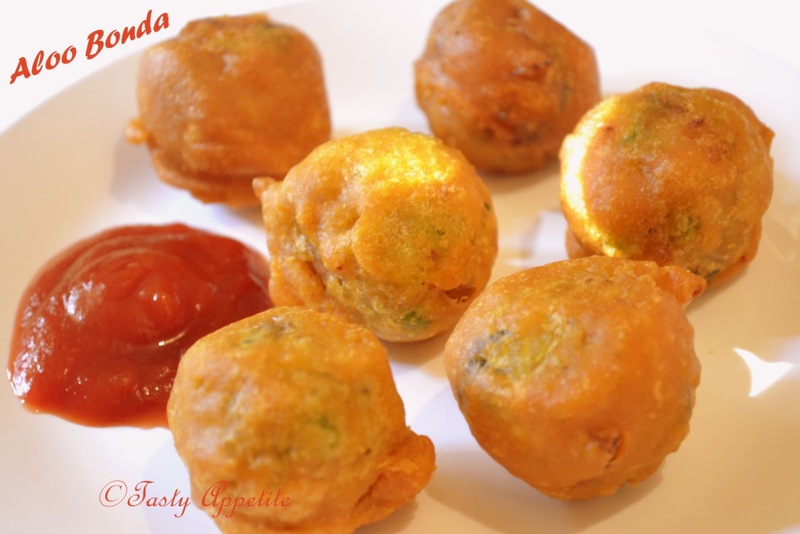 Excellent Bonda.. craving for it..
this is one of my husbands favourite snacks....perfect in these chilly winter evenings.....thanks...wish you and your family a very happy new year. This is something I'd love to try at home! It's vegetarian and looks so yummy!!! I'm bookmarking this recipe! Hola Jay!! Un buen entrante para acompañar una cervez bien fria. Enhorabuena. Un saludo y FELIZ AÑO 2.012!! These look yummy. I love this type of Indian snack. Happy New Year! Wow, these are great snacks, I never ate something like that before, I'm definitely going to try them. hi...looks so good....i just want to know..what is "besan flour" and "hing"...in malaysia i never hear this item...actually i like indian food...sometimes name of d item is different here.. Thanks for liking d recipe Rafi Khan. Besan flour is Kadalai maavu in tamil. Also it has other names as chickpea flour, gram flour, chana dal flour, garbanzo bean flour. And hing is commonly referred as asafoetida powder, perungayam powder in tamil, also known as Devil's Dung as it the world's smelliest spice. Do try n enjoy..!